LANDOVER, Md. 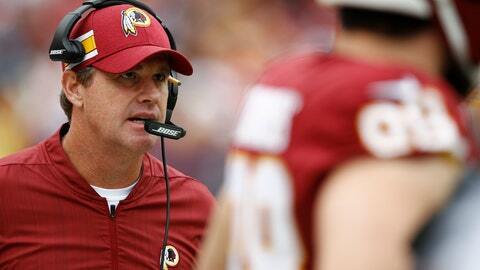 (AP) — Jay Gruden occasionally has to remind people his team is in 6-3 and in first place. It wasn’t been a flawless ride, but when the roller-coaster Redskins host the rolling Houston Texans on Sunday, it’ll be a showdown between two surprising division leaders. Washington has gotten into first place in the NFC East alternating strong and weak performances, and Houston has won six in a row to also reach 6-3 and sit atop the AFC South. Led by veterans Alex Smith and Adrian Peterson, the Redskins come into the matchup motivated by a lack of respect. Second-year quarterback Deshaun Watson and the Texans are full of confidence after digging out of an 0-3 hole. It’s a very short walk for the Redskins from their best to their worst. A three-game October winning streak and last week’s victory at Tampa Bay didn’t show their best. So there’s reason why, despite leading the division by two games, Washington isn’t getting the same buzz as other playoff contenders. Players are just fine with that. Coming off their bye week, the Texans fully understand the value of every game to their chances of winning a third division title in four seasons. Watt and Peterson are top candidates for the NFL’s Comeback Player of the Year award after turning in strong performances in their return from two straight seasons that were cut short by injuries. Watt played just eight games in the previous two seasons because of back surgeries and a broken leg. Peterson missed 19 games in the 2016 and 2017 seasons combined because of knee surgery and a neck injury. Watt is tied for third in the NFL with nine sacks and tied for first by forcing four fumbles. He also has 16 quarterback hits, 11 tackles for losses and has swatted down two passes. Peterson is tied for fifth in the league with 672 yards rushing and has scored four touchdowns. Watt raved about Peterson’s comeback. Redskins safety D.J. Swearinger, who was drafted by the Texans in the second round in 2013 and cut after the 2014 season, has not been shy to rip O’Brien. He posted on Instagram this week about “unprofessional actions” by O’Brien that led to his release, which his former coach responded to by saying he didn’t know what Swearinger was talking about. Only the Giants’ Eli Manning and Cowboys’ Dak Prescott have been sacked more this season than Watson. The Texans quarterback said he tries to get back as close to the line of scrimmage as possible so as not to lose yardage on his 30 sacks. Brown has noticed on film that defenses can force sacks on Watson when they lock down on coverage because the young QB holds on to the ball so long trying to make something happen.